Through Nov. 25 and again from Dec. 27- Jan 27 ("A Christmas Carol Musical" plays the interim month) at Westchester Broadway (Dinner) Theatre, 1 Broadway Plaza, Elmsford NY. 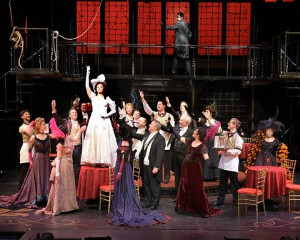 While some introductory background is required in a review of the "Phantom" musical that does not append "of the Opera" to its title, be advised upfront that the production at Westchester Broadway (Dinner) Theatre in Elmsford, NY is a top-notch staging of the one-word version of Gaston Leroux's serialized 1910 novel. Following their Tony Award-winning "Nine," composer/lyricist Maury Yeston and librettist Arthur Kopit were working on an adaptation of "Le Fantome de l'Opéra" when news of Andrew Lloyd Webber's impending version stalled the team's financing efforts. Lloyd Webber's, of course, opened on Broadway in 1988 and is still running. Comparisons of the two versions are inescapable. Both take liberties with the plot; Lloyd Webber's skips over some incidents, while "Phantom" adds a major character that illuminates the Phantom's backstory and humanizes him, which either adds to the romance and intrigue or detracts from the other-worldliness. Take your pick. Musically, both are pop-operatic, but where Lloyd Webber's is sung-through, "Phantom" includes a significant amount of dialogue. 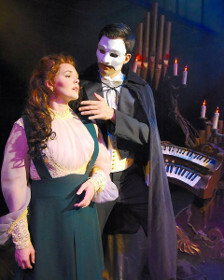 Kayleen Seidl as Christine with the cast of "Phantom". Lavishly staged and costumed and beautifully sung by its leads and ensemble, WBT's "Phantom" stands very well on its own 58 feet, thank you (21 cast members and eight musicians). Kayleen Seidl and Matthew Billman. The Phantom's father, a significant figure in this version, is played by James Van Treuren, whose "The Story of Erik" narration describes the Phantom's origin as it is enacted. An overly melodramatic tone weighs down the elongated concluding scenes, but the fault is in the play, not the players. Van Treuren and Ms. Rosenberg (Carlotta) are"Phantom" veterans, having appeared in WBT's previous productions – Van Treuren in all three. Director Tom Polum and music director Bob Bray are also returnees, a factor likely contributing to the seamless execution on stage and in the pit. The versatile ensemble, a major presence throughout, is excellent, and the 'Musical Staging,' which one assumes includes the ensemble's singing scenes as well as the choreography, is smoothly coordinated by Erica Mansfield (Cassie in WBT's outstanding "A Chorus Line" last January). 'Set Coordinators' Steve Loftus and Carl Tallent share credit for the large, circular platform that elevates from the stage floor to create the illusion of the Opera's sub-basement. Andrew Gmoser's lighting design adds the requisite eeriness to the proceedings, and Keith Nielsen's costumes evoke the period. So…while Yeston's score may not be as memorable song-by-song as Lloyd Webber's (partly because you've not heard it over and over), it is pleasing on its own, and Kopit's book unveils (unmasks?) a more detailed story than the other. "Yes," I hear you saying, "but is there a chandelier?" Indeed there is. Westchester features an elegant one – plus you get dinner.